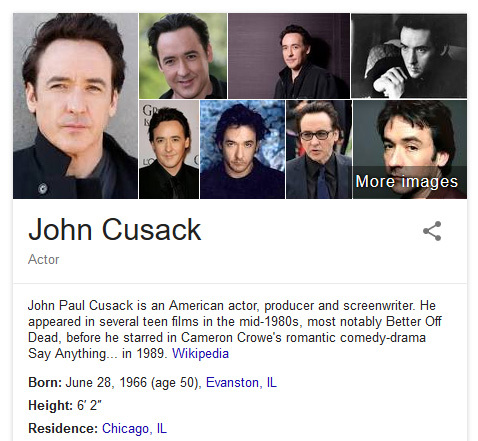 Popular and talented American actor, John Paul Cusack, has acquired his matching domain, JohnCusack.com, in a UDRP decision. The 6ft 2″ actor was born in Evaston, Illinois, on June 28th, 1966, according to Wikipedia. The domain case was filed at the WIPO, with John P. Cusack of Chicago, Illinois, United States of America, represented by Much Shelist PC. The Respondent is Whois Privacy Corp. of Nassau, New Providence, Bahamas. The disputed domain name was registered on April 13, 2003. There was no response filed by the domain registrant and Respondent in this case. Adam Taylor, sole panelist at the WIPO, ordered that the domain JohnCusack.com, should be transferred to the Complainant. Trivia: John Cusack is the second Hollywood actor named “John” to have gotten his matching full name .com in a UDRP, after John Stamos took home JohnStamos.com last year.